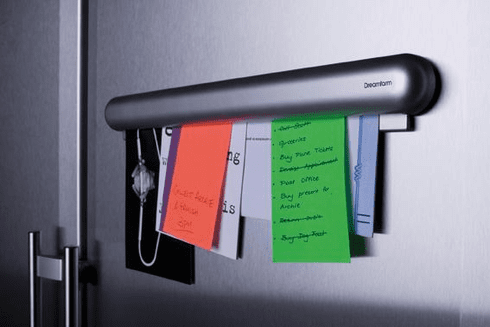 Whether on the fridge door, filing cabinet or wall, we all have a central spot where we keep our notes. The fridge door never has enough magnets and the ones that are there are never strong enough so every time you close the door everything falls off. Cork boards aren't much better, there are never enough pins so you end up using one pin to stick 10 things to the board, not to mention the holes pins leave in your invitations and photos. By using gravity and friction to secure your notes, Gripet eliminates the need for glue, pins, tape, clips and magnets. Gripet's quick grip and release system is infinitely reusable and allows you to easily store up to 3mm of notes without damaging them. With just one hand, simply push your note into Gripet's gap and it stays in place, pull it down and it's out. Gripet is the clever, convenient and easy way to organize your life's notes, memos, photos, bills and bulletins.